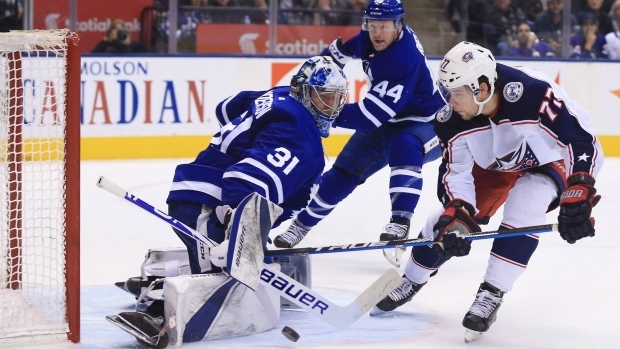 TORONTO – For the first half of Monday’s game against the Columbus Blue Jackets, the Toronto Maple Leafs looked lifeless. And then Frederik Andersen added a spark. It wasn’t with points on the scoresheet, but with his steadying presence and 37-save performance in the crease that Andersen injected his team with confidence to overcome a 2-0 first period deficit and score four unanswered goals en route to a 4-2 victory, the team's fourth straight. It’s no wonder that in the aftermath of their come-from-behind win, Andersen’s teammates praised him as not just the best player of the night, but their best player of the season. Monday was Andersen’s sixth straight win, his fifth straight game with an above .900 save percentage (.949), and the ninth time in ten starts he’s given up two or fewer goals-against. Even before Tyler Ennis scored the Leafs’ first goal with seven minutes left in the second period and got Toronto’s offence rolling, Andersen’s teammates were bolstered by his play keeping them within striking distance for a comeback. Looking surprisingly sluggish even for a club coming off a three-game sweep of California-based teams, the Leafs were ineffectual in all three zones for a period and a half against Columbus, which contributed to both Blue Jackets goals. There was the sloppy breakout by Toronto in the first period that led to Morgan Rielly, Mitch Marner and Ron Hainsey all fumbling with the puck and eventually turning it over for Cam Atkinson to bury behind Andersen. Then with 47.5 seconds remaining in the first, both Nikita Zaitsev and Jake Gardiner couldn’t control the puck before Pierre-Luc Dubois scored. The late goal helped galvanize Andersen to come out leading the Leafs’ charge. Once Ennis broke the ice for Toronto, the Leafs’ top line of Tavares, Marner and Zach Hyman took over generating the next three goals while Andersen stymied the Blue Jackets’ attack. Marner helped get Tavares on the board with a great individual effort, going in alone on Sergei Bobrovsky with Tavares trailing, picking up his own rebound off an initial shot and sliding a pass back for Tavares to shoot in. That was Tavares’ sixth goal in five games and both he and Marner finished with two points on the night. With the game tied in the third, Hyman tipped Rielly’s point blast past Bobrovsky to give Toronto a lead, and then Hyman iced the victory with an empty-netter. It was the first two-goal game for Hyman since Oct. 7, 2017, and a six-point night for his line. Meanwhile, Andersen turned aside a huge breakaway chance for Josh Anderson in the second and made a behind-the-back stop on him later in the third, plus he executed a critical glove save on Markus Nutivaara through traffic early in the final frame to deny Columbus a go-ahead goal. With his league-leading 12th win of the season in 17 starts under his belt, Andersen now also owns the second-best save percentage in the NHL among starters (.935) in what’s rapidly shaping up to be the best season of his career. As the Leafs’ fourth line centre, Frederik Gauthier doesn’t garner much attention, but his steady play this season is worth noting. And now, he’s adding in some more offence, too. Through his first 15 games this season, Gauthier had zero points but was sound defensively, and his line with Ennis and Josh Leivo has no goals-against this season. Slowly but surely, Gauthier has gotten involved more offensively, and has two points in three games to show for it after adding the primary assist on Ennis’ goal Monday. For a unit that only starts in the offensive zone about 34 per cent of the time, Gauthier’s line still spend about 48 per cent of its time in an opponent’s end, which speaks to their ability to control the puck and breakout well. Prior to generating Ennis’ goal, the Leafs’ fourth line was one of their most effective. Ennis nearly had a goal in the first when he fired a puck off the inside of the post behind Bobrovsky that ricocheted back out. They finished the game at plus-one. The Leafs have struggled all season to make Toronto a tough place to play in, and a clunker on Monday wouldn’t have helped the cause. But with the win, the Leafs find themselves with a winning record (6-5-0) at home for the first time since Oct. 14. Monday marked the Leafs’ third straight win on home ice, a streak prior to which they’d never won more than a single game at a time in their building. The Leafs had no power play chances against Columbus, and took no penalties, making that the first time all season special teams hasn’t been a factor in a game for Toronto. Fresh off a long road trip, the Leafs head back out on the road to take on the Carolina Hurricanes on Wednesday. “Our team never gives up in here and that’s something special. At the same time, we have to come out ready to play more.” - Mitch Marner, reflecting on the Leafs’ poor start and ability to rally past Columbus, 4-2.